Paddle Steamer Waverley is being prepared for the forthcoming season which starts on 23rd May over the Spring Bank Holiday. 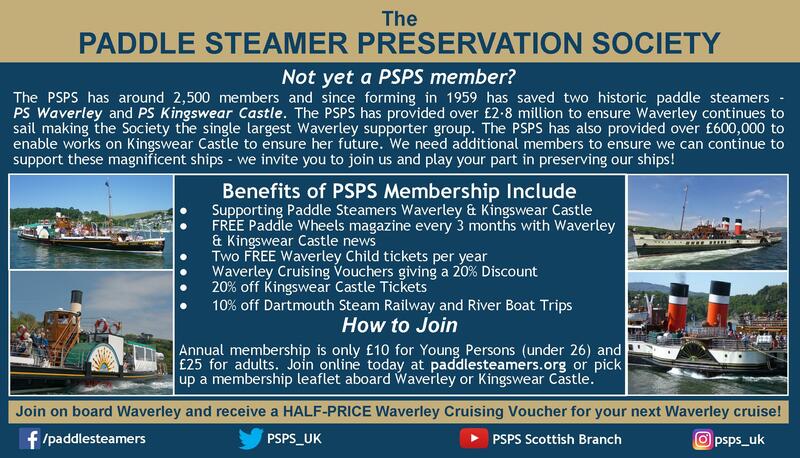 Waverley's main Clyde summer season starts on Friday 14th June and will operate through to Sunday 1st September. Unfortunately, Helensburgh Pier will not be available to Waverley this season but to maintain links with the supportive local community in Helensburgh Waverley Excursions will operate a bus link to Kilcreggan every Thursday and Saturday to connect with the ship. In referring to Helensburgh Pier not being available this summer, a spokesman for Waverley Excursions commented, "We are grateful for the support shown to Waverley by locals and visitors from Helensburgh over many years. For this season we will increase the number of calls at Kilcreggan to allow us to maintain a service from Helensburgh. We are grateful to Argyll & Bute Council for its assistance in allowing Waverley to make additional calls at Kilcreggan." Waverley's Clyde timetable will be published in the coming days with passengers from Helensburgh being advised to book in advance if they wish to make use of the inclusive bus service from Kilcreggan.